Help! My MacBook Pro is saying that it has run out of application memory. My Mac has been sluggish ever since. I hope I can get it fixed ASAP because it is getting annoying. That only means that you’re using too much of your Mac’s memory. You can easily fix that by following our tips. They can help you reduce memory usage. Part 1. What to Do When Your System Has Run Out of Application Memory?Part 2. How to Free Up Memory Space by Uninstalling Apps?Part 3. Minimize Memory Usage with Our 5 Tips.Part 4. Conclusion. Part 1. What to Do When Your System Has Run Out of Application Memory? Is your Mac taking a long time to launch apps and open files? Are you seeing the spinning rainbow wheel way more often now? Those are simply telltale signs that your Mac is soon running low on memory. The more obvious sign is an error message saying that your system has run out of application memory. To run efficiently and allow you to multitask, your Mac requires space on its disk. This will help lessen the load on your RAM and enable your Mac to run without performance issues. Open Activity Monitor to Check the Usage of CPU and Memory. As with any type of problem, you can fix it only if you know the cause. In your Mac’s case, you will need to access Activity Monitor to check up on its memory usage. It is simply a task manager that shows you the apps and processes that are running and how they use your Mac’s memory, CPU, and energy. Simply go to the Applications folder > Utilities > Activity Monitor. You will see 5 tabs on the window. You will only need to look at 2 tabs, CPU, and Memory. CPU. This tab shows how apps and background processes are affecting your CPU. To better understand the numbers, click on %CPU to sort the list according to the percentage of CPU usage. With that, you can identify which apps and processes are putting the most load on the CPU. The CPU percentage of an app would typically range from 0% to 4%. Should you see any app with an abnormally high percentage, click on that app and hit Quit. Memory. This shows a breakdown of how your Mac’s memory is being used. Refer to the graph under Memory Pressure. The left part of the graph shows the previous state of your memory. On the other hand, the right part shows the current state. The right part of the graph is green when your Mac still has a lot of disk space. Yellow and red, however, tell you that you’re running out of space. Part 2. How to Free Up Memory Space by Uninstalling Apps? When your system has run out of application memory, it’s a sign that you need to do a bit of unloading on your Mac. Uninstalling apps is one way to do that. Let’s face it. We all have apps that we rarely use and are just taking up precious space. To successfully and completely get rid of apps on your Mac, you will need a special tool. Apps most often have hidden files that you can’t delete because, well, you can’t find them. 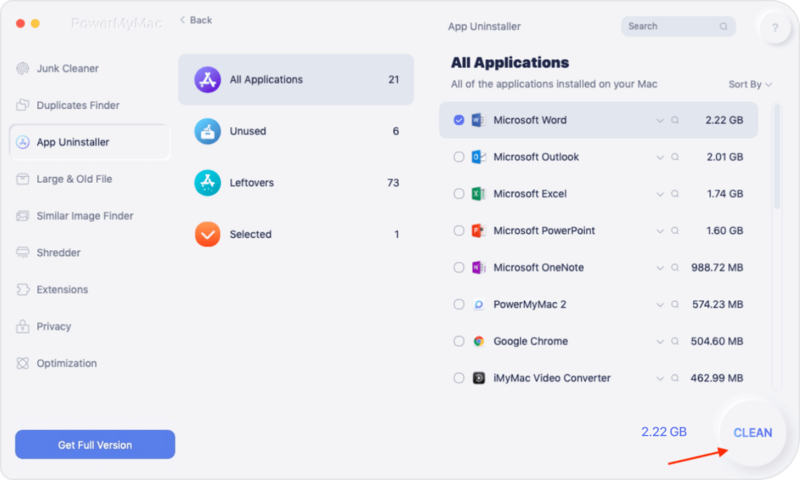 With iMyMac PowerMyMac - Mac Uninstaller, you can delete every trace of an app in a matter of clicks. This way, you can free up disk space with as little effort as possible. Step 1. Install iMyMac PowerMyMac on your Mac. Download the software. Once it is installed, run it and select Mac Uninstaller from the options in Toolkit. Hit Scan to prompt the software to search for your Mac’s apps. Step 2. Wait for the scan to complete. Wait for the software to finish searching for your apps. The scan will stop once it is complete. Step 3. Choose apps to uninstall. A list of installed apps will appear on the screen. Check the box beside the apps that you wish to uninstall. Once you have made all of your choices, press Clean then Confirm. Part 3. Minimize Memory Usage with Our 5 Tips. Tip 1. Clean up your desktop. Keeping your desktop clean and organized doesn’t only look good. In fact, keeping your desktop cluttered and full of icons would only lead to more memory usage. Mac considers each icon as an active window, so this puts an unnecessary burden on your computer. Tip 2. Free up your Mac's disk space. Getting rid of files and app that occupy your startup disk would give your RAM a breather. It also helps your Mac run faster. If you have no idea how to look for them on your Mac, you can use iMyMac's Mac Cleaner instead. It scans your Mac for junk files and deletes them for you in just a few clicks. Apps normally eat up a chunk of your disk space, so uninstalling them would help a lot. You can use iMyMac's Mac Cleaner - Mac Uninstaller to help you with that. Completely uninstall one application as well as its files. Quickly locate and uninstall just with simple clicks. How to Uninstall Office 2016 for Mac? Tip 3. Get rid of browser extensions. Browser extensions come in many forms and can be quite helpful to us. It won’t come as a surprise if you have a number of them installed on your Mac. However, you may notice that you have a few that you didn’t even install in the first place. These add-ons can take up a portion of your RAM and reduce capacity. You can, perhaps, do away without a lot of extensions. Removing them yourself is just easy. For Safari and Chrome, you simply need to launch the browser and go to Preferences. Tip 4. Open fewer windows. Running many windows at a time is sure to wrack up RAM usage. This applies to Finder windows as well. At times, they are too many of them that they are stacked up. To keep that from happening, you can merge all windows into one. Launch Finder, click on Window and choose Merge All Windows. This will reduce memory usage and let you use Finder sans the confusion. Same goes for running multiple apps on your Mac. You should only open the apps that you need to use. Aside from that, opening fewer tabs on your browser would also help. Tip 5. Lessen Finder’s memory usage. By default, Finder searches for your files across all folders on your Mac. More especially if you have a large number of files, this process makes Finder take up a considerable amount of RAM. We can fix that by making some changes to its settings. To do that, launch Finder and click Preferences. Click on the drop-down menu below “New Finder windows show:”. Choose any of the options except for All My Files. Exit out of Finder and launch it again. Opening Finder the normal way won’t reflect the changes you’ve made. You should double-click the Finder icon in the Dock while pressing the Option key. Click Relaunch. Reducing memory usage is a must to keep your Mac running smoothly. Make sure to check Activity Monitor regularly to see what you can do to improve your Mac’s performance. In case you feel like your Mac is running slowly, restart it. That can help refresh your RAM and control memory usage. If that didn’t do the trick, use iMyMac Cleaner - Mac Uninstaller. Your Mac will thank you for it!